Hello everybody and welcome back to Everything Ham Radio. Whether you are reading this on my blog as a blog post, or listening to it on my podcast, I hope you enjoy it. This episode/post is going to be a starting point of our general topic for this quarter, High Frequency(HF). We have talked quite a bit about things that you do on VHF and UHF and have touched on a couple of things about HF, but this quarter we are going to dive deeper into HF. We are going to be talking about DXing, Contesting, Awards, Special Event Stations, SOTA, NPOTA, and eventually about mid-June talk about Field Day, Emergency Power and Portable Setups. There is so much to do in this hobby, it amazes me every time I start to research a topic for the week, just what I’m about to learn. Things that even though I have been a Ham now for over 20 years, I have never done for one reason or another. Maybe one day soon, I can get back on HF, if I ever get my station at home put back up. As you know if you have been following my blog for a couple of months, I recently moved into a new and bigger house. Unfortunately, we still haven’t gotten totally unpacked, and all my off days are busy building stuff, or working on something or another. Â Once I do get everything set up at my new house though, look out HF, here I come! High Frequency(HF) is a portion of the radio spectrum that amateur radio operators have access to use according to the FCC and the ITU. 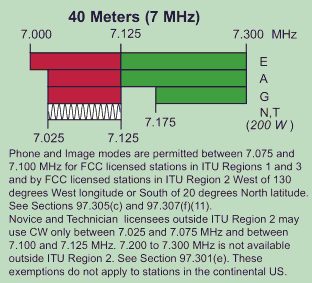 In the US, the frequency allocations for amateur radio operators is coordinated by the Federal Communications Commission and more specifically in Part 97 of the FCC Rules and Regulations. These allocations may be different in other countries and different parts of the world. There are three regions of the ITU or the International Telecommunications Union. Once every 4-6 years delegates from each region meet and discuss different topics dealing with, among other things, frequency allocations. 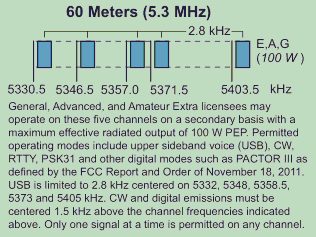 What Frequencies Are avail for me to use as an amateur extra class operator in the US? 80 meters â€“ 3.5-4 MHz (3500â€“4000 kHz) â€“ Best at night, with significant daytime signal absorption. WorksÂ best in winter due to atmospheric noise in summer. Only countries in the Americas and few others have access to all of this band, in other parts of the world amateurs are limited to the bottom 300 kHz or less. In the US and Canada the upper end of the sub-band from 3600â€“4000 kHz, permits use of single-sideband voice as well as amplitude modulation, voice; often referred to as 75 meters. 60 meters â€“ 5 MHz region â€“ A relatively new allocation and originally only available in a small number of countries such as the United States, United Kingdom, Ireland,Norway, Denmark, and Iceland, but now continuing to expand. In most ( but not all ) countries, the allocation is channelized and may require special application. Voice operation is generally in upper sideband mode and in the USA it is mandatory. 40 meters â€“ 7.0â€“7.3 MHz â€“ Considered the most reliable all-season DX band. Popular for DX at night, 40 meters is also reliable for medium distance (1500 km) contacts during the day. Much of this band was shared with broadcasters, and in most countries the bottom 100 kHz or 200 kHz are available to amateurs. However, due to the high cost of running high power commercial broadcasting facilities; decreased listener-ship and increasing competition from net based international broadcast services, many ‘short wave’ services are being shut down leaving the 40 meter band free of other users for amateur radio use. 30 meters â€“ 10.1â€“10.15 MHz â€“ a very narrow band, which is shared with non-amateur services. It is recommended that only Morse Code and data transmissions be used here, and in some countries amateur voice transmission is actually prohibited. For example, in the US, data, RTTY and CW are the only modes allowed at a maximum 200w peak envelope power (PEP) output. Not released for amateur use in a small number of countries. Due to its location in the centre of the shortwave spectrum, this band provides significant opportunities for long-distance communication at all points of the solar cycle. 30 meters is a WARC band. “WARC” bands are so-called due to the special World Administrative Radio Conference allocation of these newer bands to amateur radio use. Amateur radio contests are not run on the WARC bands. 20 meters â€“ 14.0â€“14.35 MHz â€“ Considered the most popular DX band; usually most popular during daytime. QRP operators recognize 14.060 MHz as their primary calling frequency in that band. Users of the PSK31 data mode tend to congregate around 14.071 MHz. Analog SSTV activity is centered around 14.230 MHz. 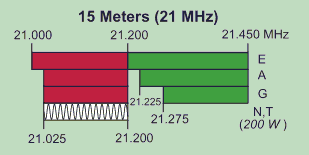 17 meters â€“ 18.068â€“18.168 MHz â€“ Similar to 20m, but more sensitive to solar propagation minima and maxima. 17 meters is a WARC band. 15 meters â€“ 21â€“21.45 MHz â€“ Most useful during solar maximum, and generally a daytime band. Daytime sporadic-E propagation (1500 km) occasionally occurs on this band. 12 meters â€“ 24.89â€“24.99 MHz â€“ Mostly useful during daytime, but opens up for DX activity at night during solar maximum. 12 meters is one of the new WARC bands. 10 meters â€“ 28â€“29.7 MHz â€“ Best long distance (e.g., across oceans) activity is during solar maximum; during periods of moderate solar activity the best activity is found at low latitudes. The band offers useful short to medium range groundwave propagation, day or night. During the late spring and most of the summer, regardless of sunspot numbers, afternoon short band openings into small geographic areas of up to 1500 km occur due to Sporadic-E propagation. “Sporadic-E” is caused by areas of intense ionization in the E layer of the ionosphere. The causes of Sporadic-E are not fully understood, but these “clouds” of ionization can provide short-term propagation from 17 meters all the way up to occasional 2 meter openings. FM operations are normally found at the high-end of the band (Also repeaters are in the 29.5 – 29.7 MHz segment in a lot of countries). *The frequencies that you are eligible to use may differ due to license class or location. See you local Frequency Coordinator Guidelines for further information, or click on the corresponding Band Plan link next to your region above. Graphics are for Region 2. Most of the topics that we have covered so far in this podcast has been mainly on VHF and UHF. With VHF and UHF, where you are limited in distance by line of sight, with HF you talk use ionosphericÂ Modes or skywave propagation. So what is the difference? The difference is that rather than you signals traveling line of sight from one station to another, your signal will bounce off the ionosphere and head back to earth. The frequency that you decide to talk on determines which layer of the ionosphere that it bounces off of and how far your signal travels. 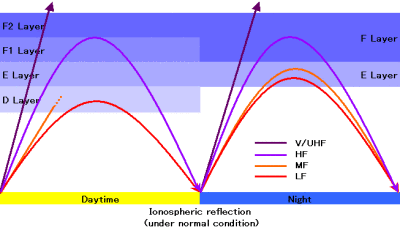 When you use frequencies in the HF area, you signals will bounce of different layers of the atmosphere and bounce back to earth. The higher the frequency the less of a chance for it to bounce back because of the refractive index of the frequency. Different frequencies bounce off of different layers of the atmosphere. If you have ever participated in an HF net, whether it was a ragchew or an emergency net, in the evening, you may have noticed the band condition might have changed on you. This is especially true on the 20 meter band. During the daytime hours, the 20 meter band is a good choice for long distance communications because the F layer of the ionosphere splits because of solar radiation into the F1 and F2 layers. Once the solar radiation dissipates when night falls, the F1 and F2 layers will combine again into just the F layer and your transmission on 20 will start to falter. This is the reason that on emergency nets, the 20 meter band will be used during the day and the 40 meter band will be used at night. One of the major emergency nets in the US is the Hurricane Watch Net. The Hurricane Watch Net activates for all hurricanes that are a threat to land in the Atlantic and as needed in the Eastern Pacific. Normally, the net will go into full activation whenever a storm is within 300 statute miles from land and moving towards that land. On occasion, the net may activate for tropical storms or hurricanes before they reach the 300 mile zone if requested by the National Hurricane Center. Unlike on VHF/UHF where you use the FM mode to communication most of the time, on HF it is just the opposite, most of the time you will be using AM or amplitude modulation. In AM mode, you have three parts of a wave, you have the carrier and the upper and lower sidebands. With AM signals the carrier is constantly sent whether you are saying something or not, the two sidebands are basically mirror images of each other both containing the same information or audio. After years of using AM mode in radio communications, it was discovered that you could use only one sideband of the signal and improve the signal quality while using less bandwidth. Thus the use of a single sideband was born and is still used today. So which sideband should you be on one a certain band? It has been agreed upon worldwide to use a specific sideband band on a certain band. Â Use LSB on 160 meters through 75 meters, USB on 60 meters, back to LSB on 40 meters and then all bands above 40 meters use USB. This club sponsors the Idaho State Convention which is this coming weekend, April 22-24, 2016. The Convention will be at the Wyndham Garden Hotel at 3300 S Vista Ave, Boise, ID. For more information about the Idaho State convention, check out their website.